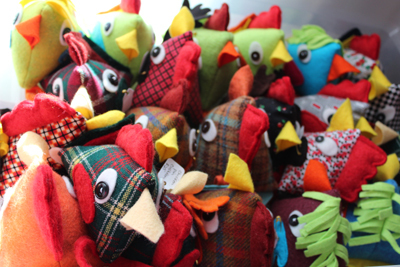 A whole flock of silly little chicken pincushions. 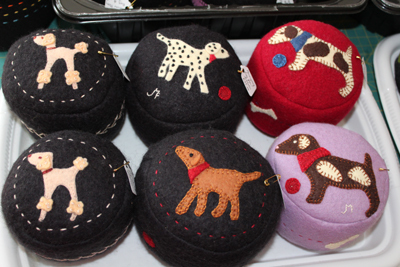 This year's new Penny-rug style dog pincushions. 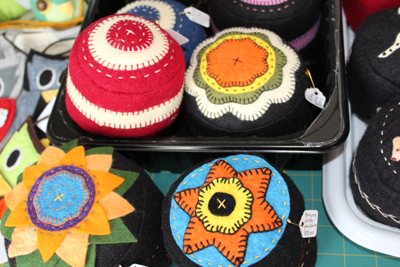 Colorful Penny-rug style designed pincushions. 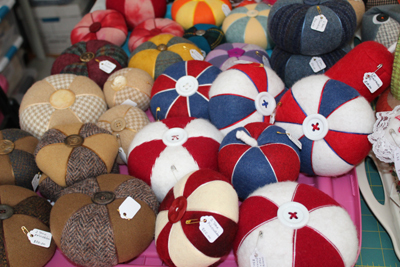 Two-toned with Button old fashioned wool pincushions, all sizes. 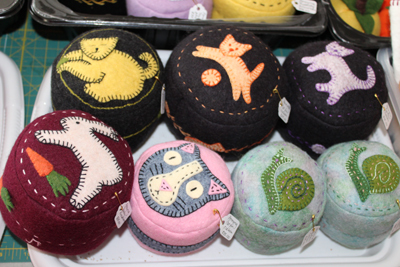 Floral and other designed Penny-rug style pincushions. 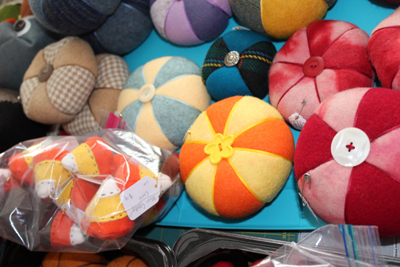 The biscuit-shaped pincushions are what I call biscornu pincushions. 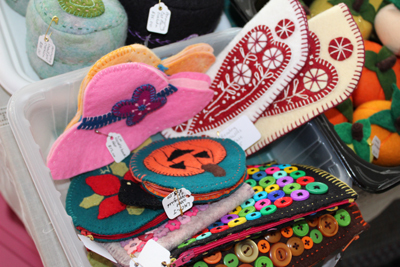 Needlebooks, eyeglass cases, coin purses and button purses. 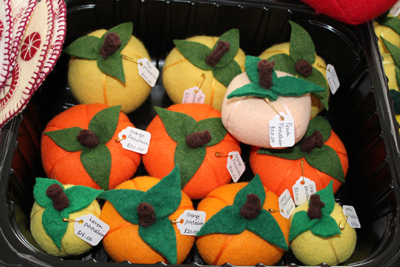 Fruit pincushions including yellow pears, oranges, peach and lemons. 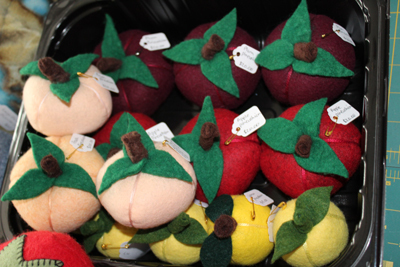 More fruit pincushions, including plums, apples, peaches and lemons. 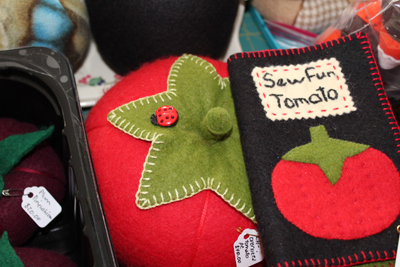 Over-sized tomato pincushion and needle-book. 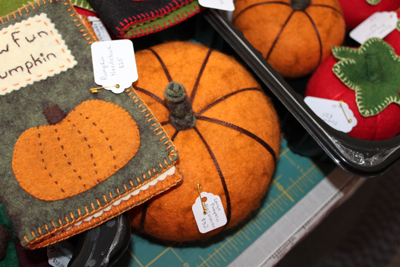 Over-sized pumpkin pincushion and needle-book. 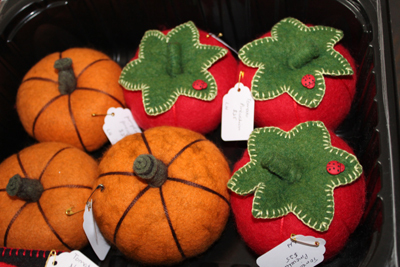 Regular-sized pumpkin and Tomato pincushions. 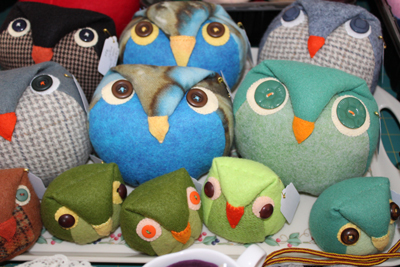 Large and small owl pincushions. 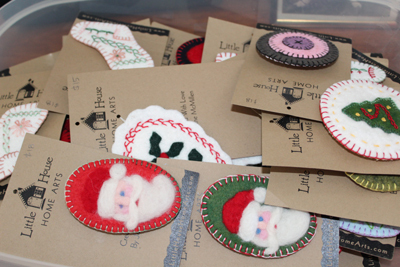 Penny-rug style pins and ornaments. Everyone is invited to attend this Open House at Bedlam Farm at 2502 State Route 22, Cambridge, NY from 11 AM to 4 PM. It is a free and fun event which will include poetry readings, book signings, a preview of Jon Katz's new book, Gus and Bud, to be published by Simon and Shuster. Jon is a NY Times Best Selling author, so come meet him in person! His books will be for sale, along with other books by his friends and book signings are all part of the event. 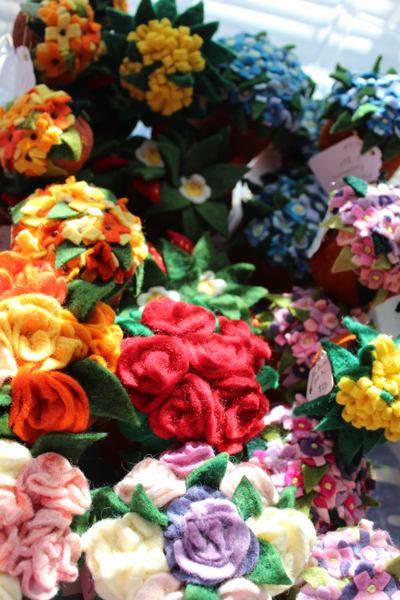 There will be sheep sheering, sheep herding demonstrations and a sale of art wares by eight different artists in Maria's schoolhouse studio. There will also be performances by the Albany Warriors Chorus Group as well as Sisters of the Shawl Belly Dancing. I will refer you to Maria@fullmoonfiberart.com for more details. 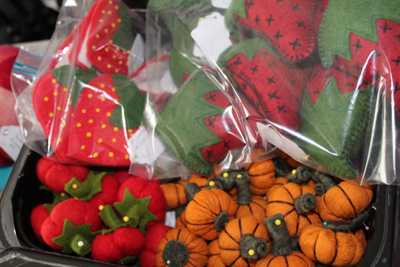 The variety of designer pincushions you will see will include felted wool flower-pot pincushions, two-toned old-fashioned wool pincushions, various fruits and vegetable sorts of pincushions, as well as chicken and owl pincushions. 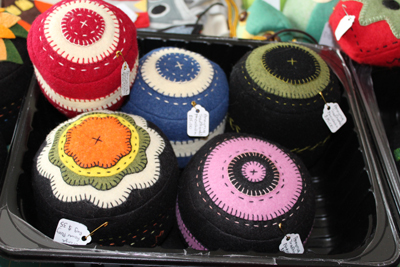 What I am best known for are what I call "penny-rug" pincushions. 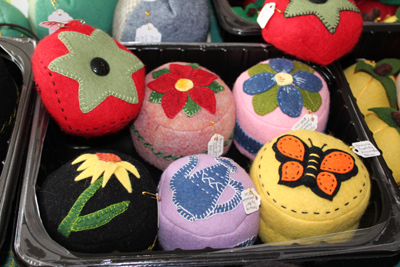 These are colorful appliqued felted- wool pincushions, embellished with embroidery, reminisce of early penny-rugs made in the 1800's. 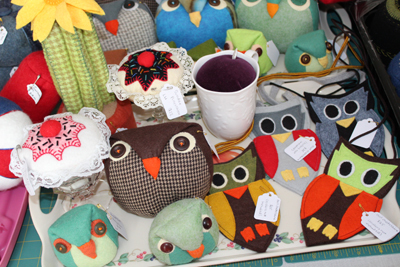 Other miscellaneous items, include felted wool coin purses, button bags, eyeglass cases and needle-books and owl chatelaine scissor holders. 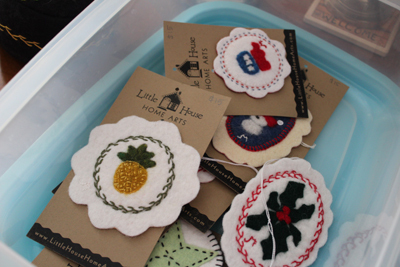 Know that whatever is left over from this sale will be featured later in my shop on Etsy (at Littlehousehomearts) This shop will be closed during this event at Bedlam Farm. Besides my wares, there will be seven other artists' work displayed and on sale in Maria's school-house studio! All are welcome! It is a lovely way to spend part of your Columbus Day Weekend as you celebrate leaf peeping season in Upstate New York and Vermont! Labels: 8th Annual Open House and Art and Craft and Book sale at Bedlam Farm at 2502 State Route 22, Cambridge, NY from 11 AM to 4PM October 6th and 7th. Free and all are welcome!